The 2005 STA study also identified 95 process improvement opportunities including potential process/integration efficiencies, functional enhancements, cost savings, and reduced cycle times. In January 2013, the State requested that Information Services Group, Inc. (formerly STA) refresh the cost estimate of the project, as well as update and confirm the State’s implementation scope and phased timeline. 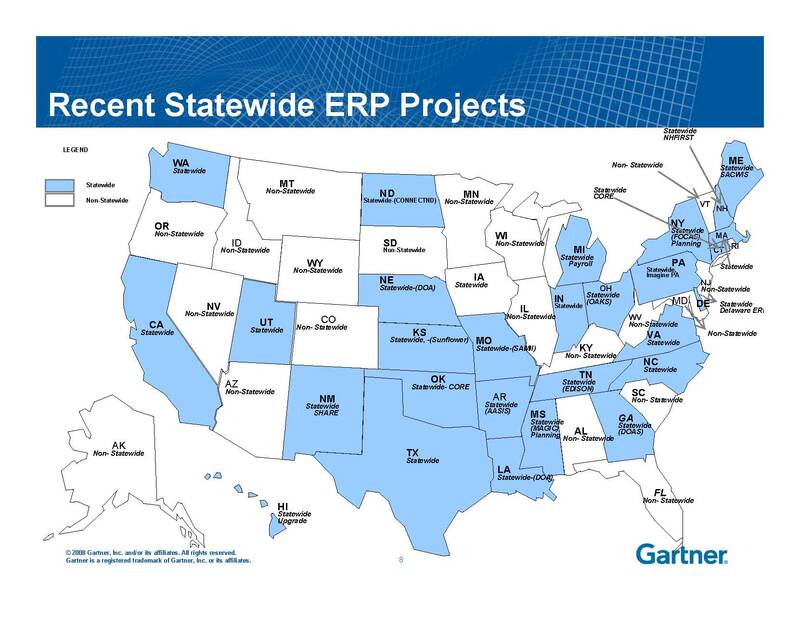 ISG has successfully applied its Business Case Analysis (BCA) methodology in assisting the following states in evaluating the extent to which investing in a statewide ERP system would be business justified: Arizona, Kansas, Louisiana, Minnesota, Tennessee, Texas, Virginia, Washington, and West Virginia. “An ERP system is a suite of fully integrated software applications that are used to perform administrative business functions such as financial management, procurement, human resource management, and payroll. What distinguishes ERP systems from a collection of stand‐alone, best‐of‐breed applications is the integration that enables more efficient processing and eliminates redundant data entry and system reconciliation tasks. “The functionality provided by ERP systems is usually provided in major functional groupings, or modules, that typically address the major administrative functions within state government. Certain additional ERP features cross all functional modules such as: automated workflow, electronic approvals, security, reporting, business intelligence, and data warehousing. “Budgeting for contingencies is a necessary part of planning an ERP project. Of their very nature, ERP projects span multiple fiscal years and contain elements of risk that may be unknown at the time of project initiation. For a project of the scope and timeline of the planned ERP initiative, unexpected events will occur that will have a direct or indirect cost impact to the project. Over a ten year period (the timeframe STA used in its 2005 report), the State expects to spend $253,452,172 on implementing a new system and ongoing IT operating costs. In turn, the State will realize a total savings of $353,100,025 from the elimination of existing systems. That leaves a net savings of $99,647,853 for the ten year period. Not only will the State ultimately save money from implementing an ERP system, we will now have one efficient, modern enterprise-wide system that is consistent and complete across state agencies. This new system will provide the State with key data related to procurement, human resources, accounting and fiscal management to drive business decisions.